Denver is often the first stop for visitors to Colorado. With its proximity to the Rocky Mountains and walkable downtown, the Mile High City has the benefits of both an urban and outdoors destination. For the budget-conscious traveler, there are many free, interesting things to do in Denver. Here are a few highlights to take advantage of in the city. Denver is one of the many cities that offer open galleries and events during the first Friday of each month. Enjoy a night of art, food, drink, and culture while visiting the district’s galleries, studios, breweries, and restaurants. The RiNo (River North) Arts District and the new Drink RiNo group will be sponsoring a free shuttle every first Friday from 5 p.m. - 12 a.m. and Saturdays from 2 p.m. - 10 p.m. Widely known for its status as the top outdoor venue in the country, the Red Rocks Amphitheater is also a great attraction during the day. Denverites are frequently found here exercising or participating in group yoga classes, or hiking and biking around the park. All craft beer lovers should be familiar with Denver’s beer scene, which includes more than 60 breweries. The Denver Beer Trail is a self-guided tour that can be found online or in print at any of the Visit Denver Tourist Information Centers, and stops by some of the city’s best breweries, many of which offer free tours. Starting in downtown Denver and ending in Franktown, this 42-mile path runs alongside Cherry Creek, meandering through historic urban districts, high grasslands, and cottonwood groves. Visitors are welcome to walk, bike, or jog sections or the entirety of this trail, taking in the sites along the way. Modeled after D.C.’s Capitol Building, the magnificent Colorado white granite, rose onyx, and yule marble houses stained glass that depicts events and people essential to the state’s history. Free tours are offered between 10 a.m. and 3 p.m. during the week, and often offers temporary exhibits and visitor galleries. Each year, visitors are exposed to Denver-unique experiences at many free festivals that the city offers. Every Fourth of July weekend, the Cherry Creek Arts Festival treats attendees to visual art, live music, and cuisine. Another festival to check out is the Colorado Dragon Boat Festival, held in Sloan’s Lake Park, also in July. From Monday through Thursday between 8:00 a.m. and 3:30pm, the Denver U.S. Mint offers free 45-minute tours, teaching visitors about the history of our currency and giving a glimpse into how it is created. No one can turn down a free tour, complete with free samples, at a candy factory. Hammond’s has been making candy in Denver since 1920, and offers tours that allows visitors to see what goes on behind the scenes. 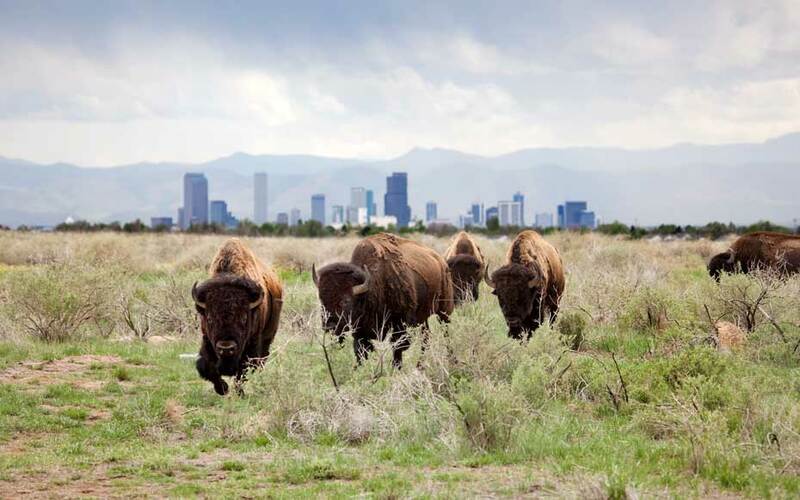 Located just outside of downtown Denver, this wildlife refuge is home to over 330 species of wildlife, including deer, raptors, bison, and black-tailed prairie dogs. Visit the interactive exhibit at the visitor’s center before embarking on a stroll along one of the refuge’s many trails. Most of Denver’s top attractions, including museums, botanic gardens, and zoo, offer regular free days. The Denver Art Museum offers free admission during the first Saturday of every month, and to kids 18 and under daily.